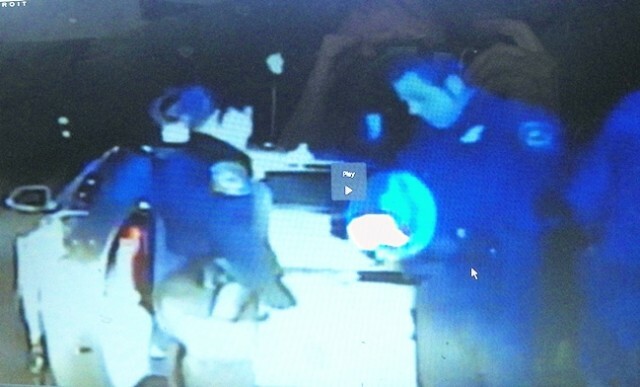 WILL ‘ROBOCOP’ MELENDEZ BE CRIMINALLY CHARGED, NOT JUST FIRED, FOR NEARLY KILLING FLOYD DENT? 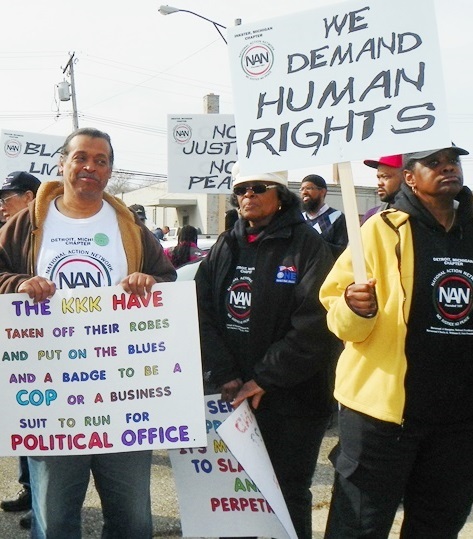 Floyd Dent (r) helps lead April 3 march on Inkster police station. He demanded that “Robocop” William Melendez be jailed for nearly fatal assault on him. 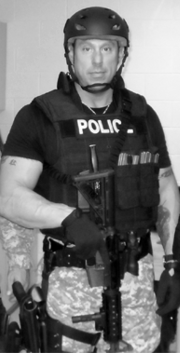 William Melendez in SWAT style armor. William Melendez in 2004. Photo by Diane Bukowski. DETROIT/INKSTER, MI – Local news sources including WDIV Channel 4 are reporting that William “Robocop” Melendez, seen in a dashcam video beating Black motorist Floyd Dent nearly to death in the Detroit suburb of Inkster Jan. 28, has been suspended with pay for five days pending possible termination from the Inkster police force. In the wake of murder charges brought against North Charleston, S.C. cop Michael Slager for killing U.S. Coast Guard retiree Walter Scott on April 4, however, many are also demanding that Melendez and the other cops who beat Dent be criminally charged. Dent said he felt he was “taking his last breath” as Melendez grabbed him in a chokehold and punched him in the head 16 times with a fist wrapped in a loaded glove. 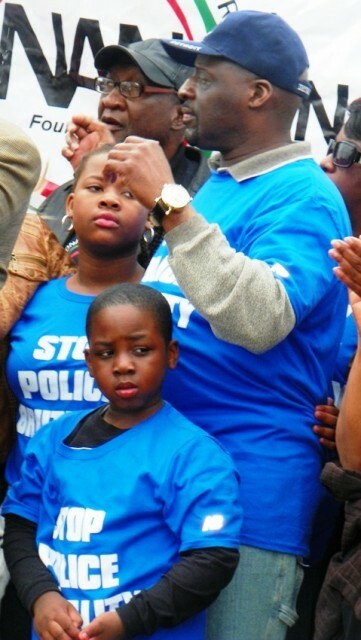 Floyd Dent and grandchildren on stage at rally April 3. “Justice is having the person that did this to me locked up,” Dent said. He is continuing to see a neurologist and psychiatrist since the beating, which left him with major injuries including a fracture of his left orbit (around his eye), subdural hematomas (bleeding in the brain), and four broken ribs. “There is word on the street that Officer Melendez is about to be suspended pending termination,” Attorney Nicholas Bennett, of the law office of Gregory Rohl, which represents Dent, told VOD just before the news broke. Ironically, it is Dent, not Melendez, who has so far faced the only charges in the case. Original charges of assaulting and resisting the crew of Inkster cops were dropped by an Inkster judge earlier, leaving a charge of possession of crack cocaine. Wayne County Circuit Court Judge David Groner is to hear arguments on whether that charge should also be dropped Wed. April 15, at 9 a.m. at the Frank Murphy Hall of Justice in downtown Detroit. 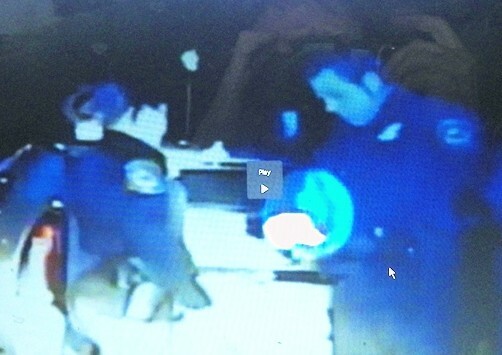 William Melendez (r) is shown on police dashcam video after he pulled a baggie from his pocket to plant in Dent’s car. Another video released to the media including VOD shows Melendez pulling a plastic baggie out of his pocket before planting it in the car after Dent was taken away. Prior to that, the video shows police and a drug-detection dog crawling all over Dent’s car and coming up empty-handed. Dent also passed lie detector tests in which he denied possessing drugs or threatening the officers in any way. WXYZ Channel 7 said Inkster police chief Vicki Yost, who previously served on the Detroit police force with Melendez, wanted to keep him on desk duty pending the results of an ongoing Michigan State Trooper investigation, but was overruled by Inkster City Manager Richard Marsh, Jr. Yost is white, Marsh is Black. Inkster Police Chief Vicki Yost. 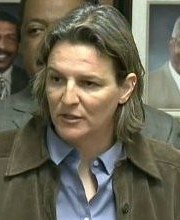 Yost was the first DPD liaison to the U.S. Justice Department after federal oversight of the DPD was declared in 2003, so she must be aware of Melendez’s record as a ringleader of a “Ramparts” style cop gang in Detroit. Melendez and 17 other cops were indicted by the U.S. Justice Department in 2003 on charges that they planted guns and drugs on southwest Detroit residents, beat them, sexually abused and strip searched them, threatened to kill them, and then falsified reports and lied in court. Melendez has been sued over a dozen times, for killing a man by shooting him 11 times on the ground, and for the incidents involved in the federal prosecution, which ended with a not guilty verdict termed “jury nullification” by U.S. attorneys. April 2 march takes Michigan Avenue on the way to Inkster police station. Cornell Squires, whose son was framed by Melendez, marches at right. Many local judges, however, dismissed charges against the witnesses who testified at the federal trial that they were victimized by Melendez and others. It is not clear when Melendez left the Detroit force. 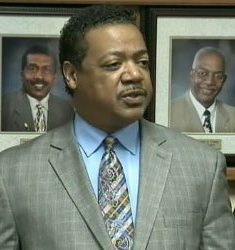 Conflicting reports say he “retired” in 2004, according to DPOA President Mark Diaz, but also that he “resigned” in 2009 before his hire in Inkster a year later. Bill Davis (l) Pres. of Detroit Active and Retired Employees Association, joined hundreds in march. 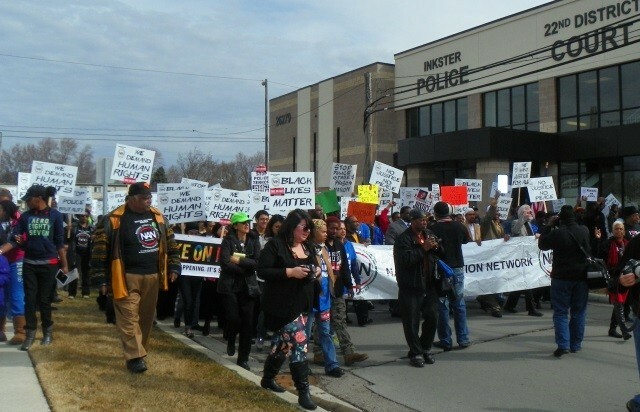 Hundreds took over Michigan Avenue April 2, to march on the Inkster police station and chant, “I don’t know what you’ve been told, but Robocop has got to go,” and “No justice, no peace, no racist police. The action was called by the Michigan chapter of the National Action Network (NAN) and MI-CAIR (Council on American Islamic Relations). Two previous protests occurred immediately after the dashcam video was aired by Channel 4. Dent himself walked in the march, accompanied by his grandchildren and his fiancé, and took the stage in the parking lot of the Inkster police department for the rally. He said he was very encouraged by the support shown during the march. The Rev. Charles Williams II, head of the Michigan Chapter of NAN, said, “We know that it’s not just Mr. Dent, but that there are others in the community who have been brutalized by police,” while Imam Dawud Walid, Executive Director of MI-CAIR, called for the U.S. Department of Justice to intervene. 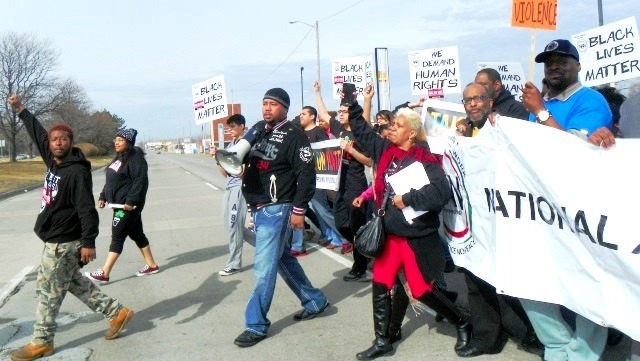 April 3 march for Floyd Dent passes Inkster police station. 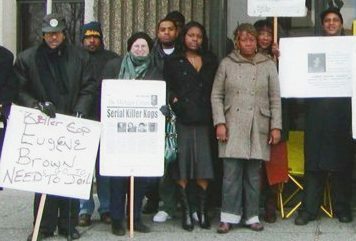 Detroiter Cornell Squires took part in the march as well, to support Dent as well as his son, who was framed by Melendez in 2000. Wayne Co. Pros. Kym Worthy (r) announces 2nd degree murder charges against Theodore Wafer in death of Renisha McBride, in Dearborn Heights. But he called on Wayne County Prosecutor Kym Worthy to first resolve a conflict involving her handling of his son’s trial in 2000, after Melendez and his partner David LeValley claimed the younger Squires had attempted to carjack them. 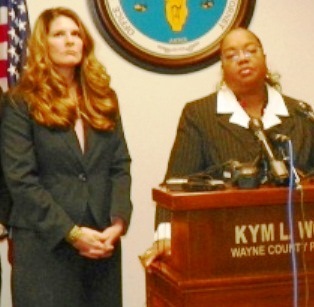 Worthy was then a Wayne County Circuit Court Judge. Squires said Worthy appeared to be biased in favor of Melendez and LeValley. Front page of letter sent to Judge Kym Worthy in 2000; to read entire document and flier, click on link at right. After the younger Squires, who was 19 at the time, was convicted of assault with intent to r0b-armed, his father discovered that Melendez had previously been convicted for filing a false police report, affecting his credibility. Their attorney filed a motion to overturn the verdict due to the new evidence, but Worthy refused to do so. “The community also sent Worthy a letter supporting Emmanuel and asking for the charges to be dropped,” Squires said. His son’s full name is Cornell Emmanuel Squires. 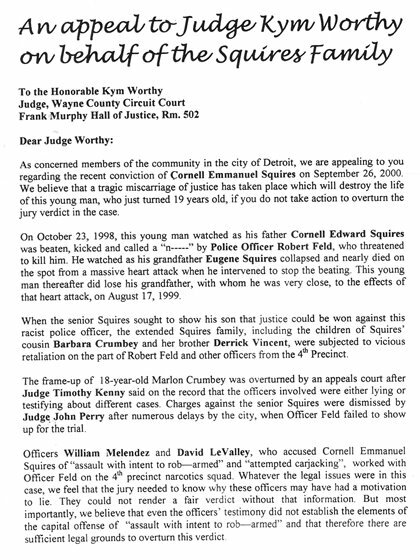 (Click on Squires letter to Worthy to read letter linking the charges with earlier police brutality case involving the senior Squires and other family members. During the trial, Worthy additionally admitted that she was ‘friends’ with Detroit police officer Reggie Crawford, who wrote on-line forum reports vilifying the younger Squires. Crawford earlier published reports vilifying Lamar Grable, a victim of three-time killer cop Eugene Brown. 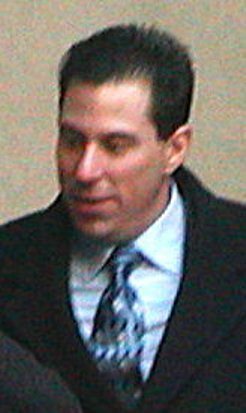 Yost was Brown’s partner during the killing. She admitted taking home the gun they claimed Grable had overnight, before turning it into the police evidence lab, and backed Brown at his civil trial. Lamar Grable’s father Herman Vallery (l), sister Arnetta Jr. and mother Arnetta Grable Sr (center) and Cornell Squires after meeting with Prosecutor Worthy’s office to demand charges against his killer, cop Eugene Brown. Grable’s family won a $4 million jury verdict against Brown in 2003 that was upheld by both the Michigan Appeals and Supreme Courts, based on Brown’s statement during the trial that he “might have” shot Grable three times in the chest as he lay on the ground. “After years of demanding a thorough investigation of my son Lamar Grable’s shooting death by Eugene Brown and Vicki Yost, an investigative team headed by .Deputy Chief Walter Shoulders was finally commissioned in 2000,” Grable’s mother Arnetta Grable told VOD. 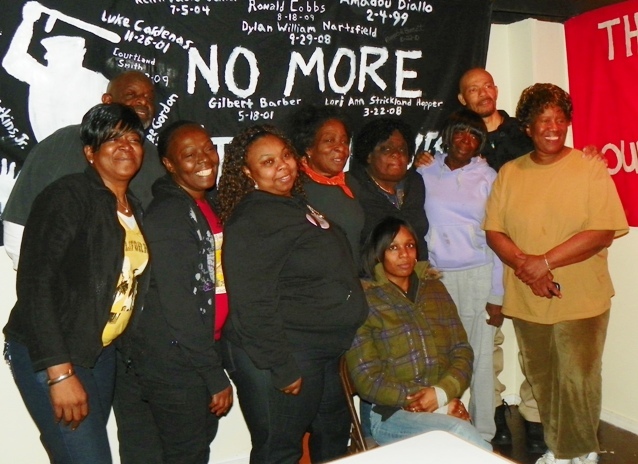 Arnetta Grable is at right in this photo of recent national meeting of Coalition Against Police Brutality, also attended by members of the Aiyana Jones Family (second from l, Mertilla Jones, Krystal Jones, and seated, Aiyana’s mother Dominika Jones. Worthy also dismissed the last charge against Aiyana’s killer, Detroit cop Joseph Weekley. The city was finally forced to release the report after reporter Diane Bukowski and The Michigan Citizen won a lawsuit granting their Freedom of Information Act request in part. “I have absolutely no confidence in Kym Worthy’s willingness to prosecute criminal cops the same way she would prosecute any other criminal. 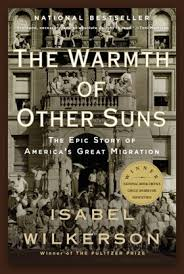 From what I have seen she participates in the same Blue Wall of Silence that allowed Eugene Brown and Vicki Yost to get away with murdering my son,” Grable concluded. One Response to WILL ‘ROBOCOP’ MELENDEZ BE CRIMINALLY CHARGED, NOT JUST FIRED, FOR NEARLY KILLING FLOYD DENT?